Collect each of the ten Propylon Indices. 5000 gold, transport between Dunmer Strongholds and Caldera, Master Propylon Index. Speak to Folms Mirel at the Caldera Mages Guild. Seek out each of the 10 Propylon Indices in order and return them to him. This one is easy - it's right in town. You can purchase it from Irgola the Pawnbroker for 500 gold (adjusted by Mercantile skill), or if you're stealthy enough, just swipe it off of the counter behind him. This one can be found on the floor of a storage room in the basement of Vivec's St. Olms Temple, behind a locked door. It's not owned by anyone, so nobody will care if they witness you grabbing it. The tricky part is it's hiding between some crates, and very hard to see. (There are also two rats in here, but that's not a big deal.) Note that it is not inside the named storage room area in the depths of the St. Olms Canalworks; it is inside the temple itself, accessible from the Plaza. This Index can be found as an offering at the Shrine in Maar Gan. It is owned by Salen Ravel, who can be found in one of the downstairs offices to the left of the shrine. He will sell it to you for 500 gold (adjusted by Mercantile), or you can just grab it from the shrine if you have the skill. This one is found in the Wise Woman's Yurt in the Urshilaku Camp. It is owned by Nibani Maesa, who will sell it to you for a much lower price of 25 gold (adjusted by Mercantile). You could steal this one as well, it's on the table in the yurt. But given its lower price, and the severe consequences that angering Nibani Maesa would have on the Main Quest, you'd be best advised just to pay for it this time. This one is very easy - it's sitting on the table next to Divayth Fyr in Tel Fyr. He will not mind at all if you take it, so there is no need for stealth. Asking him about propylon index will not add the index to your inventory, contrary to his reaction. This Index can be found in Baladas Demnevanni's chamber in Arvs-Drelen, Gnisis. It may be hard to see depending on your race, as it's on top of the right-hand bookshelf next to a book. Shorter Bosmers and Bretons may have to jump to see it. Baladas does not mind if you take it, so you don't need to be sneaky. He will mind if you take some of the other things on the shelf, so be careful that you don't miss and grab the wrong thing - especially if you're playing a race that has to jump to see it. This one is being carried by Rols Ienith, who can be found in the Communal Hut at Rotheran itself. He won't give it up without a fight, but fortunately, he's already hostile, so you don't have to worry about committing a crime when you kill him. This is a tricky one to find. It is near a skeletal corpse in an alcove in the ceiling of the Forgotten Galleries in the Shrine of Maelkashishi. You will need a Levitate spell to reach it. This cell has two entrances. The easiest way to find the Index is to enter from the higher of the two, and then look upwards across the gap to a platform with two pillars going to the ceiling. You'll need to Levitate to that platform to retrieve the index. Don't miss the Daedric Long Bow next to it, as well as a handful of Daedric Arrows both here and stuck in the pillar near the entrance. The last Index is found inside Telasero itself, in a treasure-trough in the Lower Level. Telasero is a dangerous place filled with Ash Creatures, so be prepared for a fight, and bring along some form of Cure Blight Disease. Once you bring the final Index to Folms Mirel, he will give you a special Master Index. From now on, you can speak to him any time you want to be transported to any of the ten Dunmer Strongholds. Additionally, so long as you keep the Master Index in your inventory, touching any of the Propylon Pylons will instantly transport you directly to the Caldera Guild of Mages, which gives you quick access to any of the other strongholds, as well as to the other four Mages Guild branches via the Guild Guide. You can download the quest here. It is possible to find all of the Propylon Indices yourself without starting this quest or even installing the mod. One advantage of this is that they can be used as a quick means of transport across Vvardenfell during the Silent Pilgrimage quest. However, once you have completed this quest, you will only be able to get as far as Caldera, since you cannot talk to Folms Mirel without failing the quest. The Master Index is worth 2000 gold and is 3.0 units in weight, greater than the 2.0 of the individual Indices, but still much less than the total for all 10 of them of course. One minor change made by this plug-in is that Nibani Maesa and Salen Ravel have had their services changed such that they will now buy and sell Miscellaneous items. Additionally, the Valenvaryon index has had its value reduced from 500 to 25 to make Nibani offer it for a lower price. Once you give an Index to Folms, it is gone. You cannot get it back by pickpocketing or killing him. If you do kill him after completing the quest, the Master Index will still work to transport you to Caldera, but you won't be able to travel from there to any of the other strongholds anymore. 1 Folms Mirel of the Caldera Mages Guild will pay me 500 gold for each propylon index I bring him. He'll tell me where to find one, and when I deliver it, He'll tell me where to find the next one. 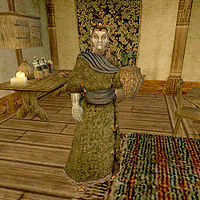 And when I've delivered ten of them, he'll make me a master propylon index so I can travel to propylon chambers in Dunmer strongholds all over Vvardenfell. First I must get the Hlormaren Propylon Index from Irgola the Pawnbroker in Caldera. 5 I delivered the Hlormaren Propylon Index and received 500 gold. Next I need the Marandus Propylon Index. It was packed and delivered to the St. Olms Temple in Vivec. Folms Mirel said to look around for empty crates in a storage area, and look carefully -- it's tiny and grey, and easily overlooked in poor lighting. 10 I delivered the Marandus Propylon Index and received 500 gold. Next I need the Falasmaryon Propylon Index. A pilgrim gave it as an offering to the shrine at Maar Gan. 15 I delivered the Falasmaryon Propylon Index and received 500 gold. Next I need the Valenvaryon Propylon Index. Nibani Maesa, a Wise Woman of the Urshilaku Ashlander tribe in Urshilaku Camp, has this index. She may not know its worth -- perhaps I can buy it from her cheaply. 20 I delivered the Valenvaryon Propylon Index and received 500 gold. Next I need the Indoranyon Propylon Index. Divayth Fyr, the old and powerful Telvanni wizard of Tel Fyr, may not want to part with it. 25 I delivered the Indoranyon Propylon Index and received 500 gold. Next I need the Berandas Propylon Index. The wizard Baladas Demnevanni of Gnisis has it. His tower is named Arvs Drelen. The folk of Gnisis seem terrified of him, but he's lived right among them for years, so maybe he isn't all that bad. 30 I delivered the Berandas Propylon Index and received 500 gold. Next I need the Andasreth Propylon Index. A Dark Elf troublemaker named Brilnosu Llarys owns the index, but he doesn't carry it on his person. His hide-out is in a dome on top of the Dunmer stronghold called Hlormaren, on the coast, due west of Balmora. I should search carefully there for the index. 35 I delivered the Andasreth Propylon Index and received 500 gold. Next I need the Rotheran Propylon Index. Rols Ienith, a deranged outlaw, has the index, and I'll probably have to kill him to get it. He lives in the Communal Hut on top of Rotheran, a Dunmer stronghold on the southern tip of Dagon Fel island. 40 I delivered the Rotheran Propylon Index and received 500 gold. Next I need the Falensarano Propylon Index. It was possessed by an outlander named Huunen last seen headed for Maelkashishi, a Daedric shrine on the western edge of the mountains west of Maar Gan. Huunen is probably dead, and locating his corpse and the index may be tough. 45 I delivered the Falensarano Propylon Index and received 500 gold. One more to go -- the Telasero Propylon Index. It is in Telasero, a Dunmer stronghold between Suran and Molag Mar, on the southern coast of the Molag Amur region. The index is in a dark place, in a troth with a number of other objects. 50 I delivered the Telasero Propylon Index and received 500 gold and a master index. Now, if I want to travel to a Dunmer stronghold, I visit Mirel and speak to him. If I have the master index with me, he'll send me directly to a given stronghold. For return trips, I activate a propylon in a stronghold propylon chamber while I have the master index, and I'll be transported directly to Folms Mirel in Caldera. Esta página foi modificada pela última vez à(s) 20h03min de 13 de fevereiro de 2016.